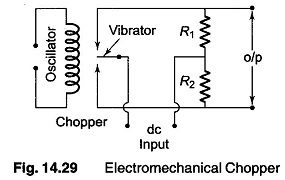 Electromechanical Chopper – An ac amplifier must see ac in order to perform useful work. A fair number of chopping and modulation techniques are available to change direct current, or to change very slowly varying signals into square waves (or pulses). Associated circuitry, inserted at the amplification system common output, may then be used to rectifier or demodulate the carrier wave and thereby produce a common dc product. The chopper is usually driven by a medium frequency oscillator, with drive frequencies for the coil between 50-400 Hz or more. High quality choppers handle voltages as high as 100 V, and voltages in the microvolt range. Most contacts are composed of similar metals and carry a maximum current of 2 mA. The approximate life is about 5000 hours.